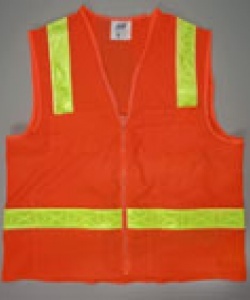 S16 ANSI Class II Surveyor's Vest 100% polyester knit, 2" retroreflective trim, Labeled To Conform To ANSI/SEA 107-1999 Standard for design and reflectivity. Color matched zipper closure. Three divisional right chest pocket (outside vest). Six divisional left chest pocket (outside vest). Two inside sewn pockets.